I’ve already talked about all the themes…For this post, I figured I could toss out a few ideas for each theme, with the idea being that if you can think of many ideas for a theme, it’s probably a good one. Some, you’ll see, will be easier than others. Remember: You don’t HAVE to follow the theme exactly, or even at all. However, there’s a “Theme” category in the scoring section. So, if you don’t follow the theme, people may give you low scores. If you can think of some angle on the theme that makes people go “Oh, I SEE how that relates”, then you’re probably in a good place. By the way, I’ll be on IRC after the theme is announced, hanging out and brainstorming! When is final voting for LD 35 ? I suppose if I’ve come this far, I should go ahead and give my own opinions on the round 3 themes, right? Once again, my own personal, biased opinions on the themes up for voting. These are, of course, merely my own opinions. If you don’t agree…sorry? I was thinking about this ‘friends’ of Ludum Dare judging debate. What if we gave contributers to the LD community who aren’t contestants a special category to vote in. You can think of this as a separate “Overall” category for people who support this community, but don’t submit a game. Regular contestants (e.g. the developers themselves) would not have access to vote in this category. This special category could be opened up to the ‘friends’ of LD that PoV mentioned, as well as others. It seems like some people are feeling like outsiders even though they’re an important part of what we do. We should do what we can to address that. If we want more people like them to take interest, we need to give newcomers a reason to spend time on us. Such a system would allow us to preserve the peer review element of the currently judged categories while allowing non contestants the ability to have their voices heard in an official capacity. I’m not suggesting we implement it for LD32 necessarily, but maybe for LD33 as part of our site rebuild. I’d like to hear your thoughts on this! I’ve noticed that the major part of the rates for my game were done in first two days and then declined drastically. I only rated about 10 games in the first two days and got 50 rates back, but during the next week I rated more than 100 games and barely got 10 rates back. I suppose the situation for other games is the same – people rated some games from the beginning of the voting list and stopped after a day or two. That’s why I’m writing this post – to give you a reason to continue. I’m the game developer, but I don’t play games much by myself. I played lots of games before, but now I spend most of my spare time coding games, supporting players in my existing games, meeting with other developers offline, and spending some time with my family. So I actually play games for about an hour or two a month. That’s definitely not enough, but I’m not ready to commit my time to playing some large game while some decent small ones are hard to find. And now I have hundreds of games made for Ludum Dare. They’re all pretty short, easy to start with, and easy to get new gameplay experience – because most of the developers tried to make them easy to understand in less than 30 seconds. So instead of playing just one game for an hour or two I play 5-10 different games per hour. I wouldn’t find such variety of game at any game portal, let alone Steam and other distribution platforms. 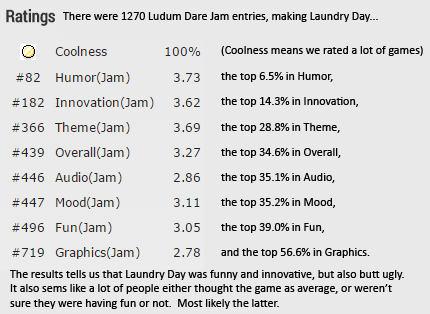 All Ludum Dare game are built around the same theme, so every developer tried to either make something completely new or implement some obvious idea in the unusual way. Yes, some games are very similar (I played at least 10 games about disarming bombs), but the implementation is always different. When you see some patter you start to focus on minor details, some cool features, sounds, or visual effects. All these little things bring you lots of new ideas for your own games. After playing games like Spacecrap I think that the pixel-perfect art is not necessary to make the game feel real. Aereo made me think about drawing all my sketch art on paper first and use the scanned version in the game (instead of triangles and simple shapes drawn in Photoshop). The 10-second Murder made me think that adding some story with backstreet intrigues instead of fancy animations may make some of my games way better. And the Duellists gave me some absolutely new and amazing ideas about the asynchronous PVP fighting for our Facebook game. I usually try to check profiles of the people who made the game I like. Some of them have Twitter accounts, some don’t, but I try to find them using google or other sources. Being in touch with people who produce some good stuff is priceless – you can get tons of ideas from what they do. Most of the people who do something interesting are usually open for conversation, they follow you back, give you feedback when you ask, and actually try to help you to succeed with your games. The community is one of the most important things for game developer. You won’t ever be in the trend if you don’t talk to people. That’s why I consider Ludum Dare a great opportunity to meet active people, check what kind of games they do in their spare time, and how they do it. If you didn’t rate any new games in last few days – don’t waste your time! You have only 12 days left. It may seem a reasonable wide time frame, but the amount of games you can rate is huge – 2213 games! If you don’t like the games appearing at the first page of voting – you can always use search to find some games. P.S. Don’t forget to check my own game – it’s HTML5 so you can try it in your browser, no installation required. Looks like I showed up late to the party, again, but I got some voting in before the final round at least — also, the link on the main page makes it look like Round 4 is up and ready, but when I got to it, it just says “you must be logged in to vote”. Maybe it’s just not ready yet? Seems weird that both would be available at the same time.